“Made It” Monday – Baby Food | Life is Good… But the Best is Yet to Come! So, I usually need some inspiration on Mondays. So I was trying to think of something fun – and thought, what about “Made It Mondays?” I could write about something I made – like, craft-wise; or a new recipe; or a goal I achieved; or even a journey I completed! Whatever comes to mind… Whatever I “made” over the last week. So, here goes… This week, I made…. I ended up buying a little baby food gadget that would steam and puree the food easily and without much hassle… And found a couple of lists of what foods to start with. But that’s about it! And, actually, I tried the gadget – and it was broken when I got it. I already prepped some food and had to get them pureed, so I did it over the stove – and Wa-la! Everything worked so easily, I returned the gadget. Silly me. 1) What you need: a small sauce pan and a cheap steamer basket (Target has a great one for $7). Then, put together a little kit with: a small cutting board, paring knife, small spatula, maybe a vegetable peeler, and a small food processor (or small bowl insert for your large one!). 2) How to do it: Wash, peel, and chop up the fruit or veggie being used. Steam it for about 10 minutes. Pop it in the food processor and whiz it up til nice and creamy (with some veggies, I added formula to make it a creamier consistency). No need to add anything – it’s that easy! 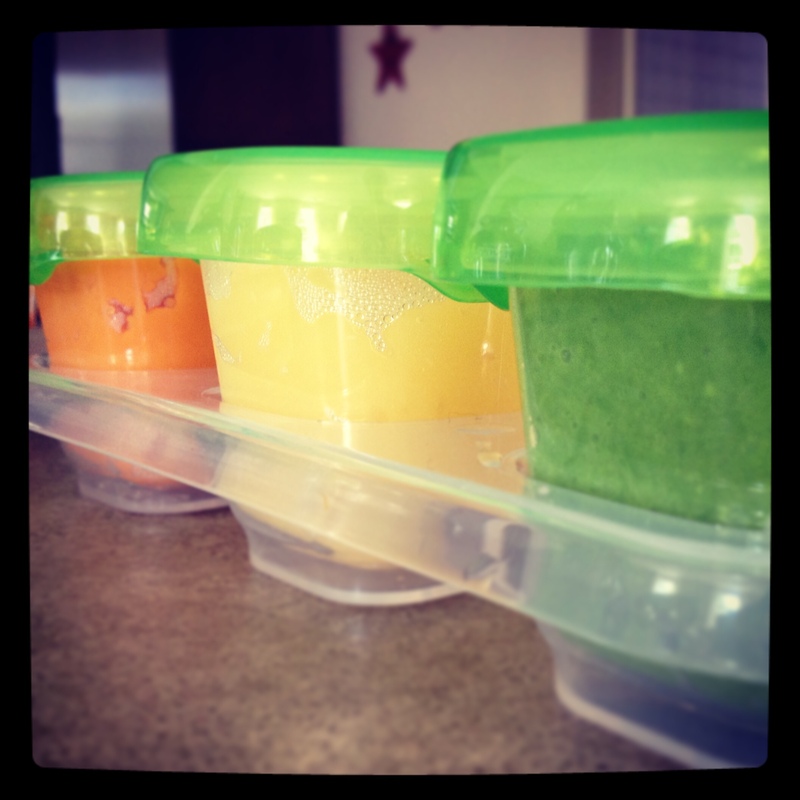 3) To store it: Some people put the pureed food in ice trays, freeze til solid, then pop in ziploc bags. Great idea! I chose to go this route, though – I LOVE the Oxo Baby Blocks. I use the small ones in the fridge and to take with us, and the large ones to freeze. I have two sets and it’s working perfect – and keeps me from making too much food. If I make food once or twice a week, for about an hour each time – we have plenty! 4) What I’ve made so far: I started with two things I didn’t have to cook (avocado and bananas). Then moved on to: sweet potatoes, apples, peas, cantaloupe, carrots, peaches, edamame, and we’re introducing black beans this week. Each food is introduced for 4 days before we try another new one (just in case there is an allergic reaction). I try to alternate fruits and veggies – and now I’m adding in meatless proteins (I’m exactly excited about pureeing meats!). It really is that easy. And he actually seems to like his food – and eats very enthusiastically! (At 7 months old, he’s all boy – eating lots!) And get this… It’s fun! I actually like taking the time once or twice a week to make his food. It’s the kind of task that you get to actually see the results of your labor – and the smiles it brings. And whether I’m entertaining him while cooking (turning the radio up and dancing around the kitchen) or I’m by myself after he goes to bed… It’s relaxing and fulfilling. What have you made this week? I’d love to hear! a quilt top! Two seams left, and it’ll be fully assembled.